Navitus Bay refusal: precedent for Stonehenge? The refusal of the Navitus Bay Wind Park proposal last September may be an important precedent for the case of the Stonehenge short tunnel scheme. 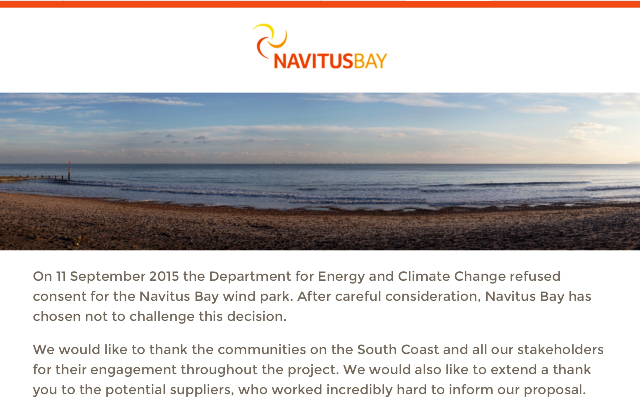 Navitus Bay’s application for a wind farm for just 25 years in the English Channel, off the coasts of Dorset and the Isle of Wight, was turned down in part for the impact it would have had on the setting of the Dorset and East Devon Coast World Heritage Site. The nearest wind turbine would have been some 14.7km out to sea. Objectors included the National Trust. “. . . there is limited scope to mitigate the impacts of the Development on the WHS and that, even with mitigation measures in place, the harm to setting, significance, and OUV of the Site carries significant weight against a decision to grant consent. . . The potential damage A303 widening would cause to the World Heritage Site at Stonehenge would be far greater than that of the wind park to the Jurassic Coast – and it would be permanent. It is significant that Navitus Bay developers have since confirmed that they will not be seeking a Legal Challenge to the Secretary of State’s decision. Let’s hope that the example of Navitus Bay will encourage the National Trust and Historic England to reconsider their support for a short Stonehenge tunnel.